Syllabus of the Online Course (Subject): European Investment Bank (EIB). Enlargement Countries. In 1994 was created the European Investment Bank (EIB), the financing body of the European Union, to help small companies. The function of the European Investment Bank is to supply long-term finance in assistance to foreign direct investment projects. The European Investment Bank is the largest international non-sovereign lender and borrower. The majority shareholder of the European Investment Fund is the European Investment Bank, with which it forms the 'EIB Group'. 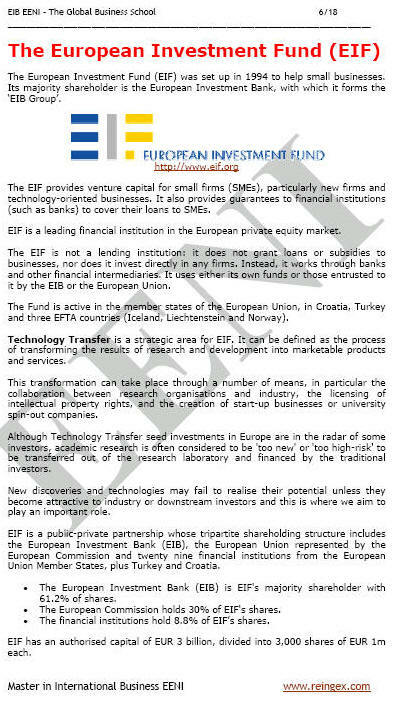 The European Investment Fund provides venture capital for Small and Medium Enterprises. It also provides guarantees to the financial institutions (banks) to cover their loans to Small and Medium Enterprises. The European Investment Bank encourages the European Union Neighbourhood Policy in the Eastern Partner Countries by financing substantial interest projects for the EU. The European Investment Bank received legislative approval from the Council of the European Union Ministers to become active in Central Asia (Kazakhstan, the Kyrgyz Republic, Tajikistan, Turkmenistan, and Uzbekistan) in late 2008. The European Investment Bank belongs to the European Economic Area of Western Christian Civilisation.